Inspiring goalkeeper Predrag Rajkovic is expected to become one of the best goalkeepers in the world. Aged just 21, the full Serbian international is currently playing in Israel for Maccabi Tel Aviv and is eventually expected to make the step up to one of Europe's biggest leagues. The impressive 6 foot 3 inches goalkeeper started his career in his homeland and made his first apperance for Jagodina in 2012. From there, he made a move to Serbia's biggest club, Red Star Belgrade, where he became a first team regular right away at the age of 18. A surprise move to Maccabi Tel Aviv was next in 2015, with the Israelis paying a reported 3 million euros for his signature. Rajkovic made his first apperance in the Serbian national team in 2013 against Colombia, a surprise call up by legendary coach Sinisa Mihajlovic. Since then, Rajkovic has gone from strength to strength. In Israel's Premier League the keeper proves himself over and over again with numerous important saves and excellent distribution. What is the most impressive skill of Rajkovic though is his agility. For a 6 foot 3 keeper, he is incredibly nimble. Capable of moving around his goal with stunning dexterity. 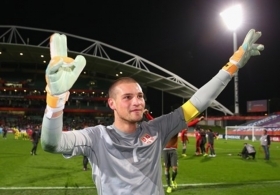 It is anticipated that Rajkovic will become one of the finest goalkeeping prospects of his generation.